Not the most glamorous item of outdoor clothing, and a bad choice won’t matter that much, but they are still an important garment affecting comfort and weather protection on the hill. Some walkers favour tight and stretchy legging-style trousers like the infamous Ronhill Trackster, others a loose-fitting cargo-pant style. Regardless – they need to offer unrestricted movement. Full-cotton trousers are not ideal – taking an age to dry when wet, but cotton blends such as polycotton are much better. Fully synthetic fabrics are perfect though, lightweight and quick drying while resisting wind. The number and distribution of pockets is a matter of personal choice, though I find loads of overloaded pockets annoying. Living in Scotland and possessing transparent skin I’ve been slow to embrace convertible trousers – but on those rare occasions where they have proved useful I have appreciated them, assuming the zips don’t rub of course. In winter a pair of softshell trousers is ideal, but in this review – and the companion review from Helen – we’ll be looking at some of the many pairs of trousers available for non-winter walking. 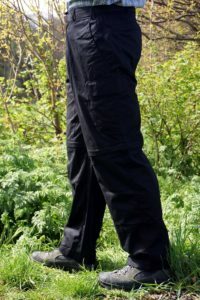 A good, basic walking trouser, the Kikut use a polyester and cotton blend which dried faster than pure cotton and benefits from the strength, durability and wrinkle-resistance of polyester, but it’s quite heavy and still retains moisture for longer than a pure synthetic despite a water repellent coating. They feel bullet-proof, with the thick fabric further reinforced at the inside of the ankle – though some form of tightening at the bottom hem to draw in the excess fabric when not wearing gaiters would be appreciated. With a generous cut movement is unencumbered, helped by articulated knees. The pockets are just right – two zipped pockets on the upper thigh, two zipped handwarmer pockets (both fitted with reversed zips) and an open rear pocket. The zips have a nice smooth action, aided by cord zip pulls, and one of the thigh pockets has a neat internal ‘gadget pouch’ that will just about hold a small GPS unit. Fastening of the plain waistband is via a Velcro-reinforced popper that stays shut throughout vigorous activity. 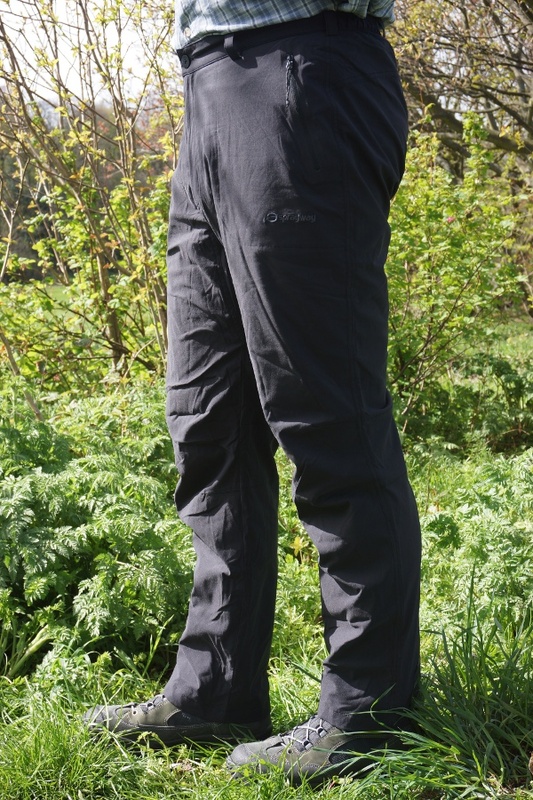 My favourite convertible trousers, these have been used for general travel as well as hillwalking, with the flexibility to cope with Italian sunshine as well as Scottish spring hillwalking. The synthetic fabric resists weather while remaining cool and drying quickly, and in really warm weather I can even unzip the lower legs to reveal sensible-length shorts. In full-trouser mode the ankle cuff can be cinched in by means of a toggle and shock cord, with the loose end kept captive nicely. There are six pockets – two zipped thigh pockets with external flap, two handwarmer (one with a little internal zipped pocket) and two rear pockets closed with Velcro flaps. The extra ‘give’ afforded by the waistbelt is appreciated, and the metal stud closure is secure. The fabric isn’t as durable as thicker options, and the light sandy colour isn’t the most practical (other colours are available), but in warm weather these are an excellent choice. Available in three leg lengths. Nobody likes wearing waterproof overtrousers, but as the name suggests, these trousers are designed to be worn all day, not just slipped over walking trousers during rain. Beneath the DWR-coated outer stretch fabric is a fully taped waterproof lining which feels pleasant against the skin and unrestrictive, much like ‘normal’ walking trousers in fact. This double layer of fabric – one waterproof – does make them a little too warm for summer use, though they’re surprisingly lightweight at 400g. 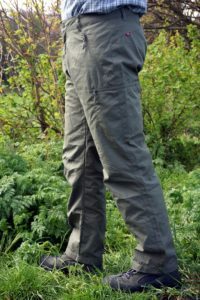 The styling and fit is close – very little excess fabric unlike waterproof overtrousers, and there is no adjustment at the ankle cuff. Pockets are limited to two zipped handwarmer pockets and the semi-elasticated waistband fastens with a metal button. 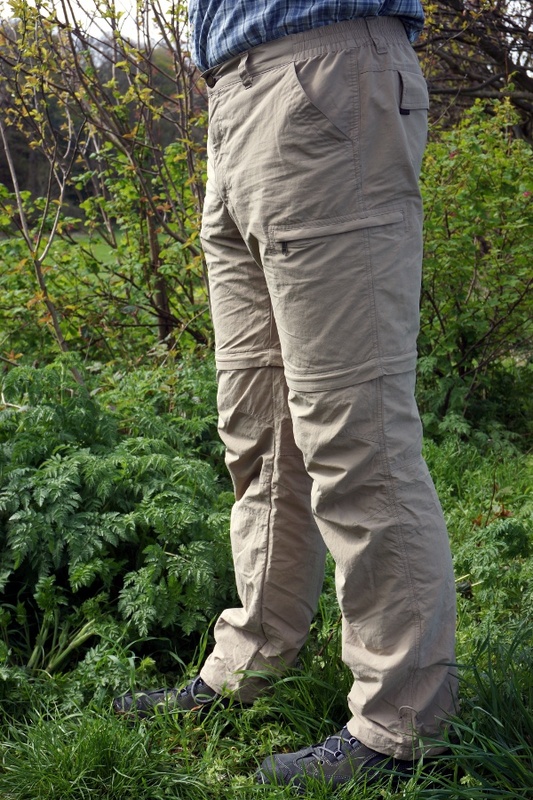 Very much a travel trouser rather than hillwalking-specific, the Maui II has features such as a hidden zipped passport pocket inside the left cargo pocket – one of many pockets – and an included belt. The Nikwax Parameta A Cotton+ fabric is a blend of cotton with synthetic yarns which performs that classic Paramo trick of actively sucking moisture from the skin before it spreads out on the surface for quick evaporation. With ripstop reinforcement running through and the cotton and polyester combination these are rugged trousers that also manage to be lightweight at 400g. Now – the pockets. Two gusseted cargo pockets on the thigh accept an OS map and are secured with easy buttons (one contains the zipped inner pocket), there are two handwarmer pockets and two rear zipped pockets. The waistbelt has elasticated sections and the belt is practical. Good, comfortable, general purpose outdoor trousers. Wonderful trousers. 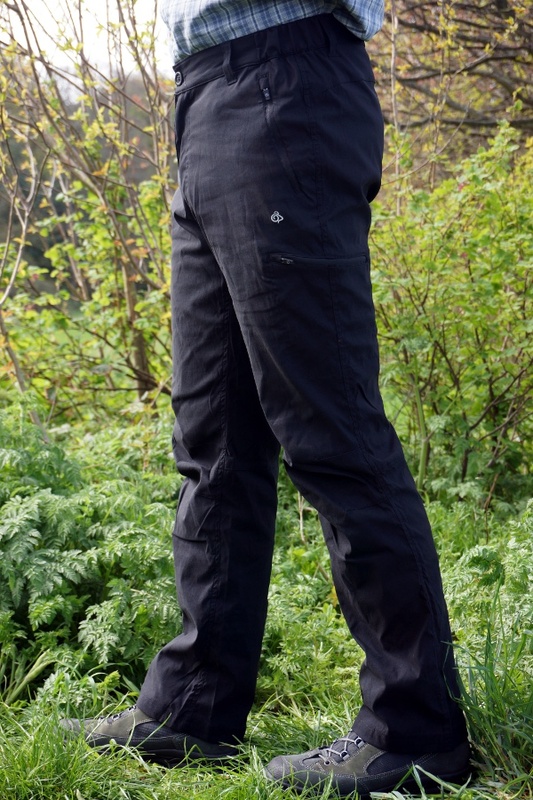 Everything I want in an outdoor trouser – fully synthetic, lightweight and weatherproof, yet with enough venting options to cope with warmer weather. They also dry incredibly fast – a huge plus when fording rivers swollen with snow melt or simply when the waterproof overtrousers have been left at home… From the top: the elasticated waistband is fleece-lined and supplied with belt with side-release buckle which does double duty if you need to lash something onto your pack (and you don’t mind your trews falling down). The cottonesque fabric has reinforcements at the seat, knees and inner calf, but the fabric has little stretch so they really need to fit your physique to maintain freedom of movement. At the ankle a series of popper allows the cuff to be tightened around the top of the boot, and there is a short zip to allow you to take them off with your boots on or to accomodate high-leg footwear. A couple of zipped mesh-backed thigh vents team with the two zipped mesh-lined handwarmer pockets for hot and sweaty ascents, but there is also a convertible version of the trousers available. The Terra Pants are available in three leg lengths. 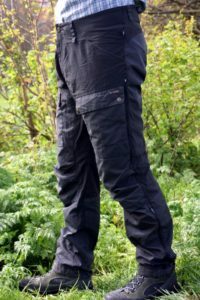 By shopping around these can be found for even cheaper than the already low price, and despite an unrefined fit and features they are pretty good basic walking trousers. The polycotton fabric is thick but comfortable though it doesn’t cope with moisture that well. 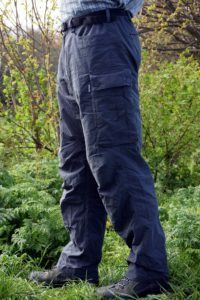 The design is classic cargo pant, with two Velcro thigh patch pockets, a couple of deep handwarmer pockets and two rear pockets, one zipped. One handwarmer pocket also conceals a zipped “secure pocket” handily labelled with a ribbon zip pull to ensure any potential pickpocket is fully aware of the location. The part-elasticated waistband also has a side-release buckle belt and is secured by a button and zipped fly. The lower legs unzip just below the knee – though when kneeling I often found the zip ending up directly below the kneecap which is annoying. Good value, particularly if the styling of more technical trousers doesn’t appeal. A lovely four-way stretch fabric – reminiscent of a thin softshell – makes these extremely comfortable and unrestrictive, with good wind resistance and resistance to light rain. The part-elasticated waistbelt is fleece lined, but poorly cut and bonded patch-style belt loops leave stiff edges standing proud of the top hem which don’t cause a huge problem but could so easily have been avoided. The zip on the rear pocket has a nice cord pull, but doesn’t run very smoothly on occasion, a problem that also occurs on the two thigh pockets and two handwarmer pockets. The handwarmer pockets are large enough to accept an OS map (though scrambling with an OS map in the pocket may result in an unfortunate injury). A shockcord and toggle arrangement at the ankle cinches the cuff in, but the loose end is not captive and requires some creativity to stop it trailing on the ground when pulled tight. A choice of three leg lengths is admirable though – something I personally appreciate with a 34″ inside leg. The cut and fabric are excellent, but a few niggles slightly let down this good value pair of trousers. The most stylish trousers in the review by far (despite my dodgy modelling), Swedish Fjällräven specialise in wonderfully tailored outdoor clothing that is also extremely practical. 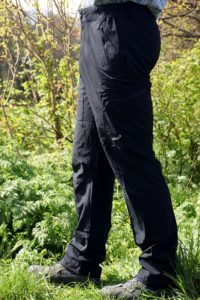 The Keb trousers are an eye-watering price, but may be the best outdoor trousers I have ever worn. The seat, front of the legs, knees and inner calf is made from G-1000 Eco – reinforced where necessary – a blend of organic cotton and recycled polyester which can be treated with wax to customise the level of waterproofing and assist with abrasion resistance. It’s a tough fabric that requires a bit of breaking in. Elsewhere stretchy polyamide offers good freedom of movement and breathes well. Two handwarmer pockets accept an OS map, and the two thigh cargo pockets are gusseted to swallow items without affecting mobility. One has a zip and the other is open, but both are protected by an external poppered flap. Behind these is an unbacked thigh-length zipped vent. I love the clever tightening mechanism at the ankle which uses a webbing strap and metal poppers. Very neat and secure. If it wasn’t for the high price these would definately be my Best Buy, so if money is no object or you can find them at a lower price, I have no hesitation recommending these. If we offered a ‘Best Value’ award these popular trousers would win – for £45 (often found for much less) there is a choice of three leg lengths and a pair of trousers with impressive features. The fabric has just the right amount of stretch, while drying quickly and resisting moisture and abrasion well, oh, and it has UPF 40 protection against UV rays. 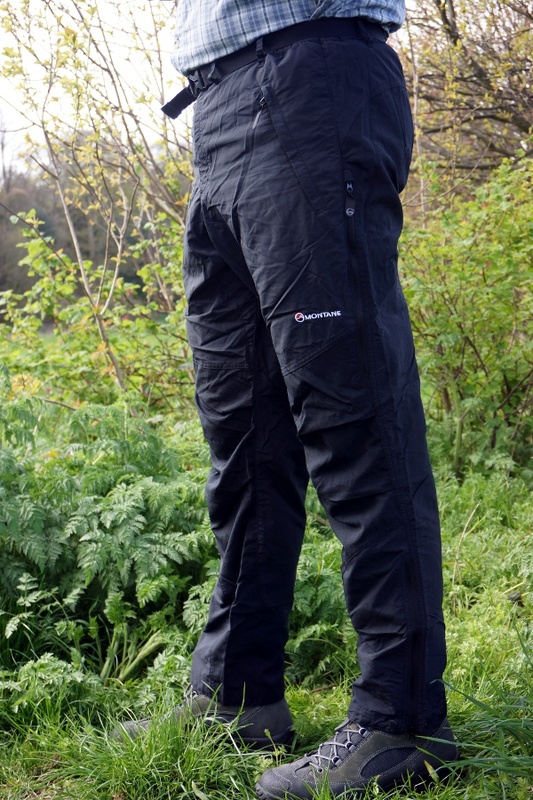 The ‘Pro Active’ model has a slightly closer cut than the normal Kiwi trousers, so there’s no flappy material at the calf, plus you get an articulated knee and zipped pockets – one thigh, two handwarmer and one rear – all with reversed zips. The waistband is part-elasticated and has belt loops, and fastens with a normal button and zipped fly. I like the removable glasses cloth inside the left handwarmer pocket – it’s unobtrusive and a nice touch, similarly the webbing heel reinforcement. They’re smart too, but only available in black. Agree with Phil? Let us know what you think on our forum.